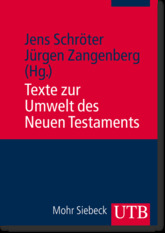 Jens Schr�ter and J�rgen K. Zangenberg present a collection of texts from the political, cultural and religious environment of the New Testament writings in German translation. Additional information about relevant persons and events as well as literature for further study are also provided. The focus of the volume is, however, on the presentation of the texts themselves. They offer perspectives on the historical developments and intellectual spaces from which the New Testament texts arose. The volume is in the tradition of the well-known collection of the famous British scholar Charles Kingsley Barrett, who died in 2011. Barrett�s edition was first published in 1956 and later supplemented and translated into German. This edition is presented here in a completely revised format. It will be of importance for students of theology and ancient history as well as for all those who are interested in the history and culture of early Christianity. Citation: Pieter van der Horst, review of Jens Schr�ter and J�rgen K. Zangenberg, eds., Texte zur Umwelt des Neuen Testaments, Review of Biblical Literature [http://www.bookreviews.org] (2015).